On Monday, May 12, IMAN was one of over 1,000 venues to host a dinner and discussion as part of the Chicago Community Trust’s (CCT) “On the Table” initiative. On the Table was an event commemorating the 99th anniversary of CCT’s incredible service and philanthropy in Chicago and an effort to engage thousands of people across the Chicagoland area in a discussion about the future of their city. 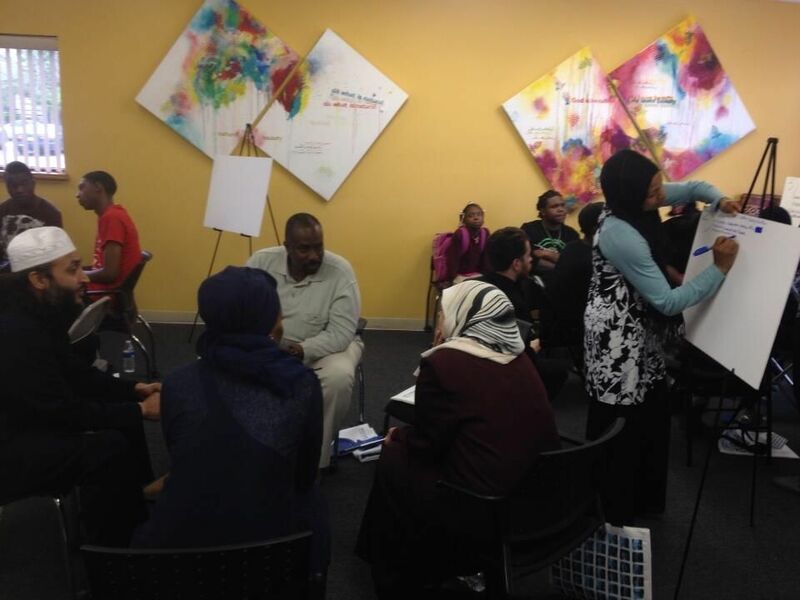 IMAN’s dinner and discussion focused on what it would take to transform neighborhoods such as the Marquette Park area into vibrant, healthy communities in light of Martin Luther King, Jr.’s legacy in the area. After viewing online footage of some of the race riots that took place in Marquette Park in the late 1970s, dinner guests separated into three groups based on the topics of access to health care and healthy food, availability of artistic and cultural resources, and local community organizing efforts. The groups discussed the root causes of some of the issues that plague our communities in these areas and brainstormed solutions to those issues, as well as thought through some of the possible barriers to success. The approximately twenty dinner guests were a mix of young people from the Marquette Park neighborhood and adult leaders from across the city, and each brought a different perspective on concrete ways to transform inner-city neighborhoods such as Marquette Park. Some of the ideas surfaced at the dinner were to pair young people up with local rising artists as mentors, to develop inter-generational community sports tournaments to bring community members together, and to develop a community health hotline that residents could call to get answers to basic health questions. CCT has been collecting the data from each of the over a thousand meal-time discussions to help inform the future of its work. This entry was posted in Arts & Culture, News, Organizing & Advocacy by IMAN Staff. Bookmark the permalink.